Ardex Flooring Distributor | CDC Distributors, Inc.
Ardex supplies high-performance building products recognized by industry-leading experts including as top-of-the-line. You can count on Ardex products to solve complex installation problems for concrete repair and resurfacing, substrate preparation, flooring installation or for setting natural stone, ceramic tile and any other type of flooring materials. Use the intelligent, cost-effective Ardex system solutions for your next tiling project. Ardex supplies everything you need, from adhesives to grouts. Whether you’re remodeling or working on new construction for kitchen, bathroom or wellness areas, indoors and outdoors installation, domestic or commercial projects, Ardex has a solution for you. The Ardex selection of primer coatings can prime and consolidate even instable, critical substrates and fill in any cracks, smoothing out your subfloor no matter what. For unstable subfloor, use an Ardex levelling compound. Even better, all ARDEX products are solvent-free, making them a great choice for the environment too. For cosmetic concrete repairs, attractive finishes and extremely durable surfaces for commercial and industrial applications, Ardex products can meet the challenge. The quick drying components mean that work can be completed quickly. Ardex resilient and timber flooring adhesives are an excellent choice for quality adhesion with EC 1 category emissions. When you’re working with mosaic parquet, industrial parquet, carpet, or linoleum, you can trust Ardex products to offer perfect adhesion. Ardex adhesives are also solvent-free and fast-drying. You know how important it is to seal substrate carefully, which is why you can trust Ardex sealing materials for indoor and outdoor use. A proven ability to keep water where it’s supposed to be in everything from domestic and commercial showers to car washes and swimming pools, makes the Ardex systems a great choice for reliable protection against water damage every time. We are headquartered in Cincinnati, Ohio, but we have auxiliary offices in Louisville, St. Louis, Columbus, Detroit, Springfield, Indianapolis, and Grand Rapids. 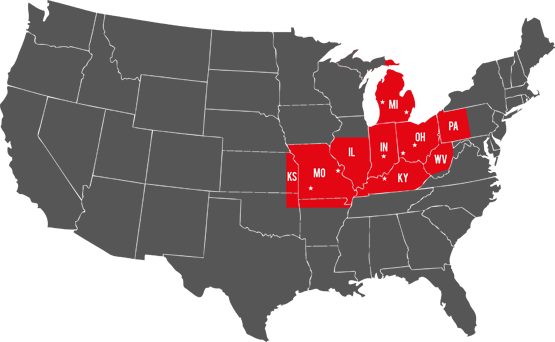 In the last 40 years we have grown to supply flooring to states across the Midwest. But one thing has always remained the same: our dedication to our customers. We only carry the highest quality products and we always work to our highest values as a company.